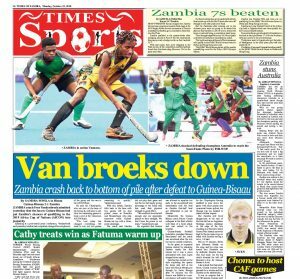 ZAMBIA coach Sven Vandenbroek admitted yesterday that the loss to Guinea-Bissau had put Zambia’s chances of qualifying to the 2019 Africa Cup of Nations (AfCON) into jeopardy. Speaking at a post-match press conference, Vandenbroek said yesterday’s defeat had completely changed the complexion of the group and the race to the AfCON final. He said the Chipolopolo, who are now at the base of the Group K, will have to win their two remaining games to book a slot at the Cameroon AfCON finals. “The loss today has changed everything. We need to win our two games remaining to qualify,” Vandenbroek said. With this defeat, Zambia falls back to the base with two games left on four points, same as Namibia and Mozambique who play tomorrow while Guinea-Bissau are top with a three-point advantage. The coach said Zambia did not play their game and lost the too ball easily giving advantage to the home side that used their physical strength to good effect. “We could not have the ball enough and our opponents played to their strength. 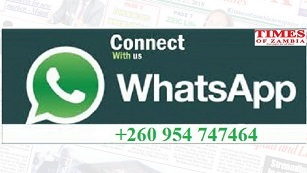 We don’t have the power in our team,” Vandenbroek said. He regretted that Guinea was allowed to equalize too early in the second-half and immediately took the lead as Zambia first-half lead got obliterated in just six minutes. Meanwhile the Guinea Bissau coach Baciro Cande collapsed at the final whistle with fears of a heart attack and was rushed to the hospital. Guinea-Bissau Football Federation president Manuel Nascimento said the coach was emotional after the win but was in a stable condition. In the game, as expected Guinea started by attacking Zambia inside the first minute but it was a move anticipated with Jose Lopes charged down easily. Zambia then turned on the style exploiting the spaces the home side left at the back with Enock Mwepu put through by Justin Shonga after 10 minutes but the chance was fluffed in a one-one chance with goalie Jonas Mendes with the tame shot going straight at the goalie. That missed opportunity was a huge disappointment and Mwepu, maybe trying to make amends a minute later, shot thoughtless high from range before his team mates spoke to him to keep his cool. That seemed to work wonders as in the 13th minute, the Austria-based midfielder charged forward and was tagged down by Sory Mane five metres off the box. From the free-kick, Shonga sweetly curled the ball in- the ball flying beyond the sprawling dive of Mendes to take the lead and quieten the crowd. Guinea-Bissau then threw all men forward looking to get back into the game and forced a series of set pieces including a 30th minute corner whose first-time connection by Picqueti Britto flew over. Five minutes later, Frederic Mendy, scorer in Zambia, jumped high to meet a Eliseu Cassama cross but his connection infringed on Zambia goalkeeper Kennedy Mweene in his box and the goal was called back to keep scores at 1-0. This was the first real scare for the Chipolopolo forcing midfield to slow down the game with short passes and occasional bursts upfront but Shonga was too isolated to make a further impact. But Zambia still lived dangerously at the end of the first-half as an Augustine Mulenga clumsy challenge on the edge of the box resulting in a free-kick which Gomes Pele blasted narrowly high for the two sides to go to break with Zambia having a nervy 1-0 lead. But on 53 minutes, Britto beat Solomon Sakala on the wing and his cross was turned into Zambia’s net by defender Stopilla Sunzu who had stuck out his leg which diverted the ball off Mweene’s dive for Guinea-Bissau to level. Like a shark that had smelt blood, Guinea wanted more, pressed for a winner and had Zambia on the tenterhooks. It was no surprise that in the 59th minute, Guinea went ahead through a Tony Silva glancing header off a Lopes free-kick on the right. Guinea had Zambia where they wanted them with confusion later taking over with crowd trouble denting this game as rowdy fans outnumbered security and easily stormed the pitch causing a stoppage after each of their goals. The travelling Zambian fans did not lose hope despite going down and drummed the entire game with the highlight being when Zambia scored as they small crowd was ore audible than the home fans. 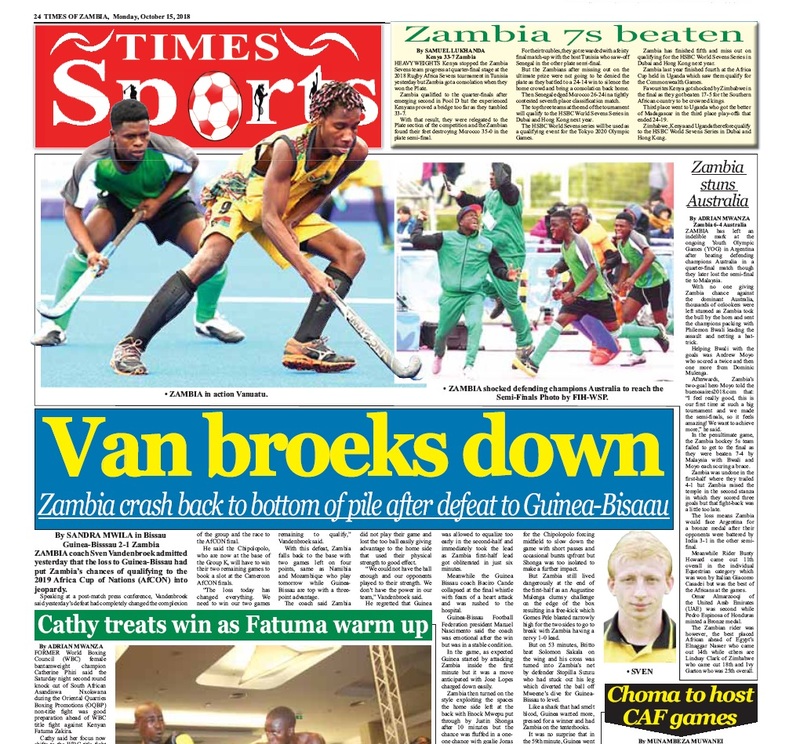 With calamity in the qualifiers eminent, Vandenbroek shuffled his cards to bring on a pacey Patson Daka for Lubambo Musonda to have a two-prong attack hoping to stretch the Guinea backline. He then rested tired Mulenga for Kambole hoping to use the pace of the two and later Rainford Kalaba came on for Clatous Chama hoping to salvage a point but the fresh pairs of legs did little to turn the tables. Other teams in the group will see Namibia hosts Mozambique tomorrow.